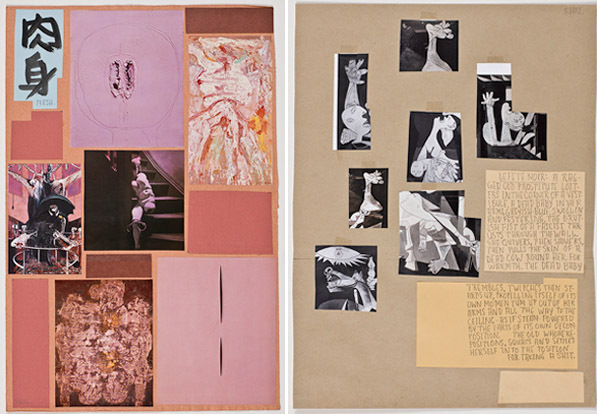 Left: Richard Hawkins, Ankoku 11 (Index Flesh), 2012, collage, 21 x 14“. Right: Richard Hawkins, Ankoku 2 (Direct Translation - Guernica), 2012, collage, 16 3/4 x 13”. The Texas-born and Los Angeles–based artist Richard Hawkins makes work that probes the connections, juxtapositions, and slippages among classical sculpture, French literature, the abject, and the teenage dreamboat. His 2010 midcareer survey “Richard Hawkins: Third Mind” was organized by the Art Institute of Chicago. Hawkins is showing his new “Ankoku” series, a work partially inspired by Butoh, in the 2012 Whitney Biennial, which runs March 1–May 27. I AM NOT A STUDENT OF DANCE––or even much of a fan––but there is something about Tatsumi Hijikata, at least on film, that I really like. Reading everything I could on Butoh for the past year or so, I got kind of fed up with the classic Western idea that Butoh is simply an articulation of the trauma of Japan’s destruction during World War II. Through subsequent research online, I found Hijikata’s Butoh-fu scrapbooks. In the mid-1960s and early ’70s, the dancer would go through Japanese monthly art magazines and cut out pictures that he “liked.” He would then tape them into scrapbooks and annotate in pencil anything that came to mind. He cut up Picasso’s Guernica, for instance, and taped it down in this interesting, unartful-artful way with hardly any faithfulness to the artist, the Spanish civil war, the original picture, or . . . anything really. Hijikata’s Guernica, according to his scribbled annotations, consists of an old prostitute trapped in a room where the walls are made of pus with a dead baby on her lap that propels itself through its own farts all the way up to the ceiling. To me it’s a super interesting example of ekphrasis, of expansion over description, a kind of betrayal, actually, in keeping with his interest in Jean Genet. Using Hijikata’s Butoh-fu as a perverse guide through postwar works that many of us know so incredibly well was really the foundation of my project. But I also liked the idea of rereading Genet––an author I’ve had love affairs with in the past––through Hijikata’s eyes. Despite the fact that historians of Butoh always mention that Hijikata was influenced by Our Lady of the Flowers, there’s hardly anything in the novel that describes movement, for example, or that would seem to be an obvious influence on the dancer. There’s lice and filth, obviously, dark things that Hijikata would’ve loved, but amazingly––to me at least––the novel begins with the author cutting out pictures of criminals from magazines and pasting them to his wall. By the end he claims that the whole novel has just been a masturbatory fantasy compelled by these chopped-up images of handsome faces and heads. That, to me, is the ultimate connection between Hijikata’s Butoh-fu and Genet. And, obviously, an important thing to understand for an artist (me) who has a history of cutting out pictures of cute guys and building fantasies around them. I also found it interesting that Hijikata hardly ever used Japanese artists or figures in his scrapbooks. Rather, he was always exoticizing French and American culture. It’s Orientalism in reverse. Maybe through all this I’ll finally figure out why my objects of desire hardly ever come from my own damn culture.